One the best things about the Yucatàn Peninsula in Mexico are the Cenote’s. Cenote’s are fresh water caves or large holes in the ground that have formed in the limestone over millions of years. They are an ideal place to go for a swim and cool off. We visited a few of the main cenote’s but the Peninsula has hundreds if not thousands of them. When it comes to visiting a cenote you have many options. Some of the more famous ones can be expensive to visit and can get very busy. The lesser known ones are just as good or even better and also tend to be cheaper or even free to visit. Our advice is to do your research before taking the plunge and be wary of expensive tours offered by hotels and hostels. Whist in the Yucatán we visited 3 cenote’s and they were all very different from one another. This was our first cenote experience and we were excited to visit. It was about a 4km cycle from Tulum which was relatively easy to do as the road is flat, it was just very hot and sunny. The Gran Cenote was also the most extensive and expensive cenote we visited. It costs a wopping 150MXP per person! The water within the cenote is clear with the staff ensuring everyone has a shower before entering so the pool remains clean. Part of the cenote is open but large parts are within caves. The centoe is also very deep and as you snorkel you can even spot the odd diver beneath. If you like you can rent a mask and snorkel or bring your own which is advisable to see the cave structures underwater. We had packed our swimming goggles which worked fine. You can also dive the cenote which will give you access to more the underwater cave system. As Tulum is a popular tourist town on the coast the cenote’s in the area can charge more than in other parts of the Peninsula. Many of the cenotes around Playa del Carmon and Cancun are even more expensive and if you are on a budget should be avoided. Oxman cenote was our favourite cenote and the best value by far. It is 5kms out of town along a dusty road to the south of Valladolid which is best reached by bicycle. We had rented bikes for the day from MexiGo (see below). This was the easiest and cheapest way to see the centoes in the area. The cost to visit the cenote was 30MXP each but it also provides access to a swimming pool (winning). The cenote itself is a huge hole which can be viewed from above. Once you get down to water level you will be amazed. The water seems bottomless and is a deep shade of blue. The whole pool is open to the sky and provides an amazing swimming experience. The owner has create a rope swing and platform to jump from which is great fun. The other great thing about this cenote is how quite it was as it is a bit off the tourist track. When we visited we had the place to ourselves which was very special. We highly recommend visiting this cenote – it is cheap, quite and spectacular with the added bonus of a swimming pool to use too. This is the most famous cenote in the Valladodid area and costs 60MXP per person to visit. It is set up for coach tour tourists and has been developed into a mini complex complete with restaurant and market. Once you eventually get into the cenote you can understand why it is popular. A small hole provides a single shaft of light into the cenote which creates a certain allure to the place. As it is popular it can get busy and a large number of tour buses stop here. X’kenken Cenote with the shaft of light. The other great thing about this cenote is that you can visit two at once. For an extra 30MXP you can visit the other cenote within the grounds. We opted not to do this but if this is your only cenote visit it might be worthwhile thing to do. One of the best ways to get around Valladodid and see the surrounding cenotes is to cycle. As we set of late in the day we only managed to visit two but you could easy see so many more. Valladodid has many bike hire options but we went with MexiGo Tours. The great thing about MexiGo is that they provide you with a map with an easy to use bike route which covers all the cenotes. 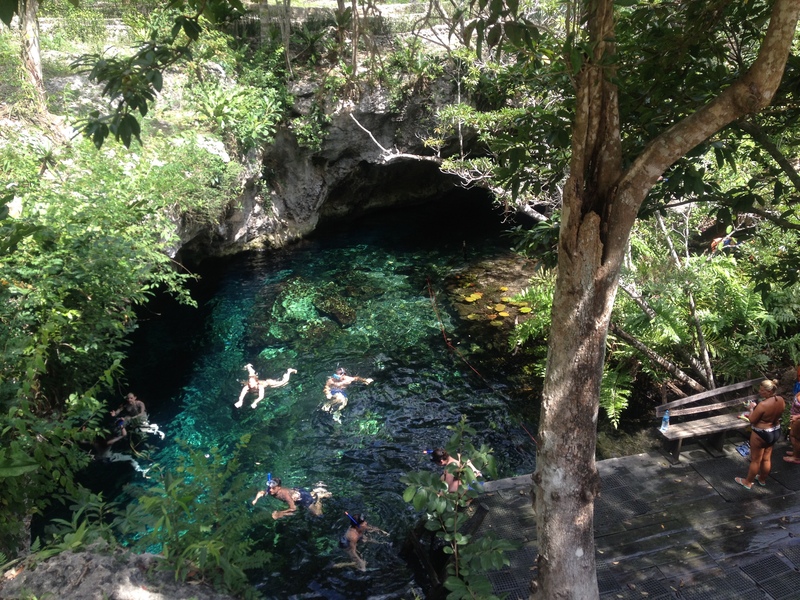 The owner was very helpful and advised of what cenotes were worth going too. Cycling around Valladodid is easy. It is flat with quite roads or cycle lanes provided once you get out of town. Mixed with the cenotes we found cycling around to be a relaxing afternoon. There are little catfish or turtles that swim in them but they are harmless. Thanks! They are amazing! We highly recommend a visit!